Mr Lant, Miss Burton and Miss Darby would like to welcome you all to Year 2. We are very excited to share our time together in year 2 this school year. We will be looking at place value and applying this into column addition and subtraction to work out calculations and tricky word problems. We will focus on developing the children's writing via poems and letters linked to the WWI. We will be also looking at story writing linked to Charlie and the Chocolate Factory. Our Topic this half term is called "Food Glorious Food". We will be looking into the importance of a healthy lifestyle and understanding a balanced diet. We will be learning about where chocolate originally came from. This will link into lessons surrounding Christopher Columbus. We will also have the opportunity to design and create our own healthy smoothies. We will be making sweets too! We have taken the decision to go on a school trip to York Chocolate factory this half term as the workshops are very cross curricular linked to our topic and literacy lessons. We will be learning a variety of lessons linked to animals including humans. 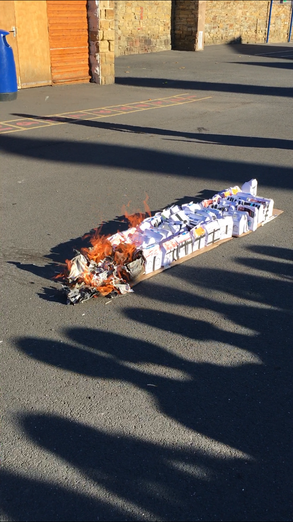 The children in Year 2 finsihed their topic "The Great Fire of London" in style! Here is the homework menu set for the Autumn 2 half term.